When the brochure for this year’s Hay Festival plopped onto the doormat, I immediately settled down to spend some time going through it. Living as I do within an hour’s drive of Hay-on-Wye, the book town has a special place in this book squirrel’s heart already. But, for one magical week of the year, it becomes everything that I enjoy in one convivial and joyous event: interesting and stimulating speakers and sessions; books; variety; books; mountains of strawberries, cherries and ice cream; more than ample people-watching opportunities; books; a buzzing atmosphere come rain or shine; and simply having the opportunity of being in the company of people who are neither ashamed of reading, nor find it remotely geeky and, above all, who are not afraid of DOING IT IN PUBLIC. 1. I signed up to be a Friend of Hay. This only costs £20 (£34 for double membership and, importantly, this is not limited to couples, so you can sign up with a friend and save money) for 12 months. For this, you not only get to see the finalised programme first but you can also book events before tickets go on general sale. Once at the Festival, you don’t have to queue for ages because there is a special Friends’ entrance to each event and you effectively get an all-access pass to the refreshment areas (some being reserved for Friends Only). 2. I’m going out of my comfort zone and have chosen a range of events. Even if you’re clear about the type of ev﻿ents you would like to go to, there is a lot of variety in the programme. The advantage of going with a friend with slightly different interests from me this year is that I’ve booked some events that I probably wouldn’t otherwise have bothered with. Past experience of going with other people has shown me that sometimes these turn out to be the best, most enjoyable and/or most memorable ones. So, mix it up a bit and get out of your comfort zone! So there are my thoughts on how to improve your Hay experience. If you’re there this year, tweet me and say Hi! 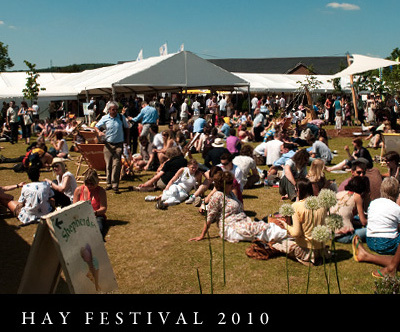 For more information on this year’s Guardian Hay Festival, check out the main Festival website which has booking information and the full programme, together with details of the Friends’ membership scheme.